“Sindhishaan”, Sindhishaan.com (India) Pvt. Ltd.
Subject : Publication of “Sindhishaan”. 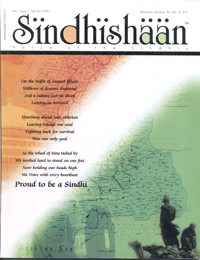 It gave me immense pleasure to receive and read your beautiful magazine “Sindhishaan”. I am very much thankful for sending two copies of the magazine to this office. The magazine has been brought - up in a very excellent manner. It is hoped that this type of efforts will further strengthen the feeling of “Sindhiyat” and will project the philosophy of Sindhi Writers in a very profound manner. Kindly accept my hearty congratulations for this efforts.